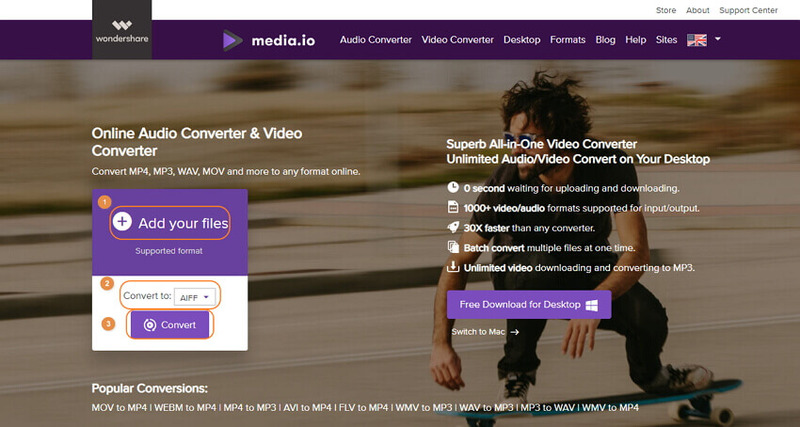 Convert AIFF audio to MP3, WMA, M4A, AAC and 1000+ audio/video formats. Edit, enhance & trim your AIFF audio files. Versatile toolbox combines screen recorder, GIF maker, fix video metadata, etc. There is no doubt that MP3 is one of the widely used media file formats that are accessible by most devices. However, there is a certain area of concern that MP3 being a lossy file format makes though little but certain compromise over quality. While AIFF (Audio Interchange File Format) is a standard audio file format used in Apple Macintosh systems. This file format is of high-quality and is preferred by those looking for lossless format and dealing with music on daily basis. Thus, it would be smart to convert MP3 to AIFF, in order to maintain quality and have versatility using the AIFF format on Apple devices without losing any data. The most recommended software for the job is Wondershare UniConverter (originally Wondershare Video Converter Ultimate). 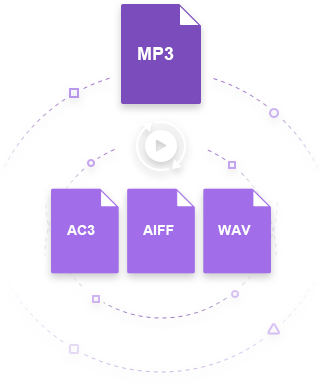 It's not only able to convert MP3 to AIFF, but also other file formats such as FLAC, MP4, WMA, WMV and many more. The great MP3 to AIFF converter also has many other useful features, like batch and background convert, edit and merge media file, screen recorder, GIF maker, etc., making it a world-class software. There're both Windows and Mac version for Wondershare UniConverter, which function almost the same. 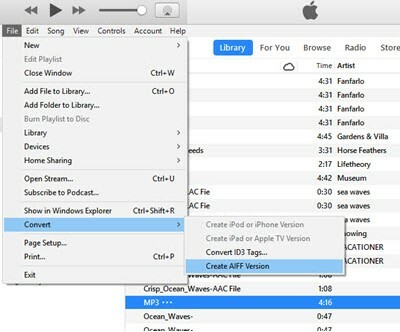 Below we'll show you how to convert MP3 to AIFF Mac for example. Download and install Wondershare MP3 to AIFF converter on Mac, launch it and proceed to Add Files to add your desired MP3 files for AIFF conversion. Click next to Convert all tasks to to select Audio > AIFF as the target output format. To make any adjustments to the quality, click on the + Create Custom button and adjust settings such as the bitrate, sample rate or others. Finally, click Create to save this customization procedure. In case you want to convert AIFF to MP3, just choose MP3 under Audio. To execute the conversion, click Convert or Convert All buttons to get started. When the process is over, you will be able to fetch the converted file from the Converted tab. 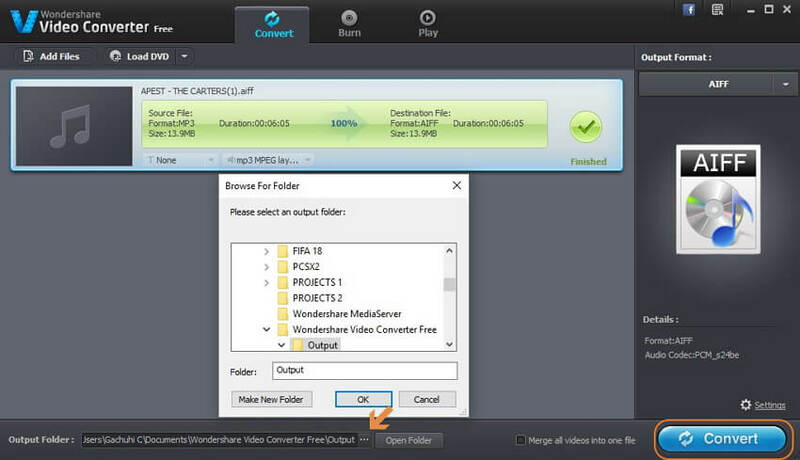 Another recommended way is to convert MP3 to AIFF free using Wondershare Video Converter Free. It is free to download software that comes with ingenious ways to convert files to any desired format. 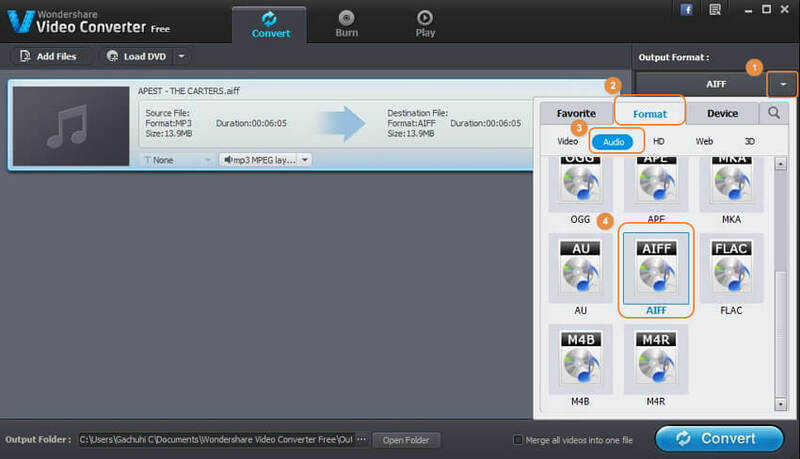 Video Converter Free supports conversion to numerous file formats and has an easy to use dashboard. 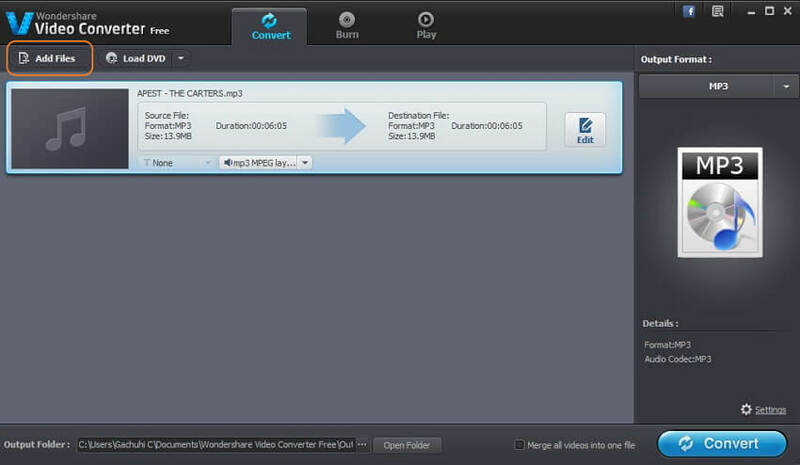 The converter lets you download from video streaming sites and has basic editing capabilities. The conversion speed is fast, and the output is of high quality. It's also compatible with both Windows and MacOS. Step 1. Launch Wondershare Free MP3 to AIFF converter and click to insert the MP3 file to be converted to AIFF. Step 2. Hit the drop-down arrow or the format icon in the right to get the output format list, go to Format > Audio > AIFF just as the screenshot shows to choose AIFF as output format. Step 3. Click … in the bottom-left to specify the destination folder, then click Convert to proceed with free MP3 to AIFF conversion. iTunes is a more popular way of converting Apple encoded media files. It also functions as an MP3 to AIFF converter for Mac offers the ability to switch between files that are predominantly apple supported, without losing the quality. You can also use other popular file formats on iTunes to convert or download the media file. The process is quite simple. After conversion, finding and saving the media may be an option to consider since the files are usually saved in a certain default folder, one may opt to create a destination folder for easy retrieval of the converted files. Step 1. Launch iTunes and click on Edit > Preferences. Step 2. On the General Preferences menu displayed, click on Import Settings to continue with the conversion process. 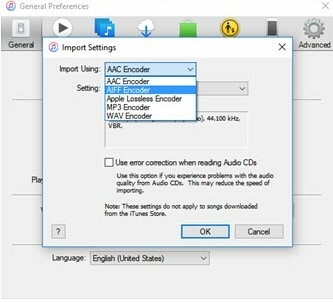 Then choose AIFF Encoder in the pop-up under Import Using option. Step 3. To convert MP3 to AIFF Mac, click on File on the iTunes menu and select Convert, then you'd see other convert options just as the screenshot shows. 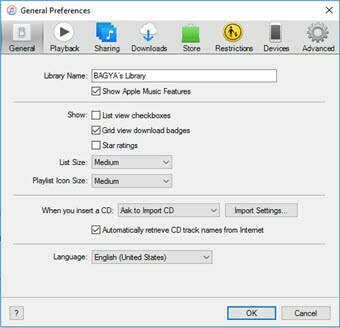 For MP3 to AIFF Mac conversion, just choose Create AIFF Version and iTunes will start changing any MP3 file format to AIFF. 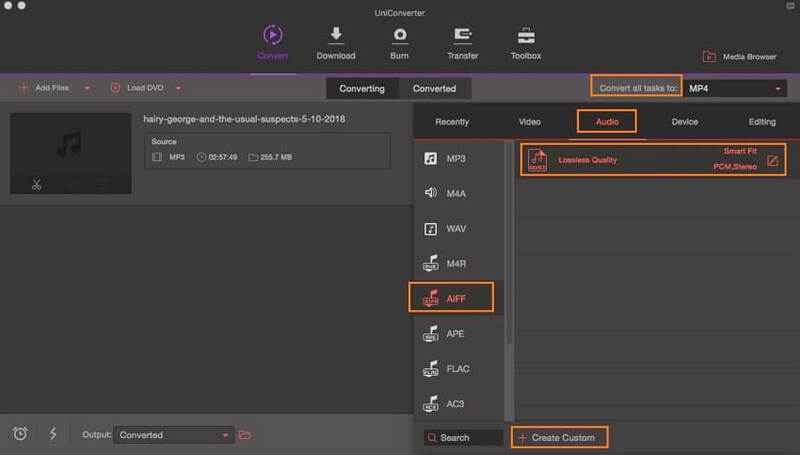 Online UniConverter (originally Media.io) is a popular online converter that enables you to Convert MP3 to AIFF online free. It is an effective yet absolutely free way to perform any file conversion. It supports conversion to many file formats with the general output being of high quality. The converter has a sleek design that makes conversion easy to perform. Moreover, it supports 2 files batch conversion at a terrific speed. The conversion process is also simple and very straightforward. Step 1. Open Online UniConverter (originally Media.io) and click + to upload MP3 file online for converting. Step 2. Choose AIFF as the output format. Step 3. Hit Convert button to start converting MP3 to AIFF. Step 4. When the MP3 to AIFF conversion finishes, you'd get a download link where to fetch the converted .aiff file. All the 4 ways that have been discussed in the article are quite established and well accepted by all. These conversion methods from MP3 to AIFF can be used to convert files, however for the most comprehensive result, Wondershare UniConverter is the best choice that not only converts MP3 to AIFF but deals with so many perks mentioned above. Its admin console is also remarkably intelligent with prompt commands and with ingenuity to undertake any processes expeditiously.